It’s hard to believe that spring will soon be here, which is high time for beginning the home remodeling process. Now that the housing market has recovered from the blow it suffered during the Great Recession, homeowners are all about home renovation and design, with 53% of homeowners agreeing now is a good time for partial or whole home renovation. 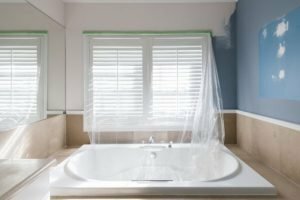 As they are the rooms that see the most use, kitchens, and bathrooms are the rooms that are most often involved in the home remodeling process. Winter is the perfect time to begin your next remodeling or renovation project. After all, what better to stave off cabin fever than to get a head start on mapping out your remodeling process? The first order of business is to take a good hard look at your finances. What can you realistically and comfortably afford to pay? Will you be taking out a home improvement loan, and if so, what is the interest rate? While it’s easy to get swept up in the excitement of planning your home design and renovation project, it’s important to consider the cost. Keep in mind, the more labor involved, the higher the cost. Unforeseen problems can arise during the process that requires may increase the cost of the overall project, so it’s important to have some wiggle room. Once you’ve determined a cost, you can then begin planning the overall look and feel of your renovation project. Perhaps you have a theme or a certain style of interior design that speaks to you. It may be helpful to consult with a contemporary architect or interior decorator to help plan your vision. Last but not least, you may want to consider ways in which you can make the renovation process as well as the end result more environmentally friendly and sustainable. Ask your contractor if they use local labor or use sustainably sourced, local materials. Or, perhaps you’d like to install solar panels or rainwater collection bins. These environmentally friendly modifications can not only improve your home’s value but significantly reduce energy costs.